Dr. Ben Carson, who recently put out word through surrogates that he felt he was unqualified to be appointed to President-elect Donald Trump's cabinet, has apparently reversed course Wednesday and is likely to accept the position of Secretary of Housing and Urban Development. Carson, once a tremendously talented surgeon, has increasingly entered the political realm after retiring from medicine. But he has no actual political experience, outside a failed bid for the presidency this year. 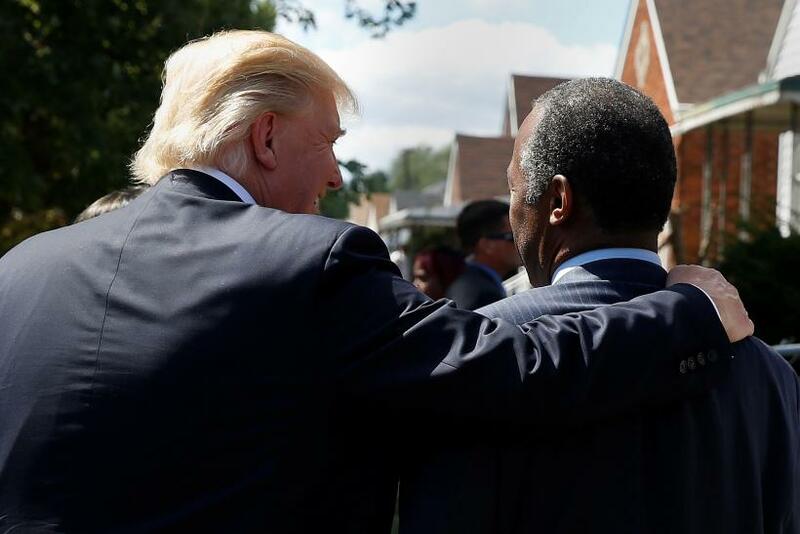 "After serious discussions with the Trump transition team, I feel that I can make a significant contribution particularly to making our inner cities great for everyone," Carson posted to Facebook Wednesday. "We have much work to do in strengthening every aspect of our nation and ensuring that both our physical infrastructure and our spiritual infrastructure is solid." The reference to spiritual infrastructure is especially meaningful, considering Carson is a deeply religious Christian who believes in Creationism and has expressed that evolution is the work of Satan. Over time, Carson has moved from being known principally as a respected surgeon to a political figure known for stirring up controversy with those sorts of claims. Here are 17 things Carson has said in the past, collected from Politico, National Journal, Salon, Mother Jones and the New York Post. "I mean, [our society is] very much like Nazi Germany. And I know you're not supposed to say 'Nazi Germany,' but I don't care about political correctness. You know, you had a government using its tools to intimidate the population. We now live in a society where people are afraid to say what they actually believe." "Because a lot of people who go into prison go into prison straight — and when they come out, they’re gay." "Grabbing the camping knife I carried in my back pocket, I snapped it open and lunged for the boy who had been my friend. With all the power of my young muscles, I thrust the knife toward his belly. The knife hit his big, heavy ROTC buckle with such force that the blade snapped and dropped to the ground." "You know, Obamacare is really, I think, the worst thing that has happened in this nation since slavery. And it is, in a way — it is slavery in a way because it is making all of us subservient to the government." "My own personal theory is that Joseph built the pyramids to store grain. Now all the archeologists think that they were made for the pharaohs' graves. But, you know, it would have to be something awfully big if you stop and think about it. And I don’t think it’d just disappear over the course of time to store that much grain." "Like most psychopaths. That's why they're successful. That's the way they look. They all look great." "Well, I mean, it's even more ridiculous than that 'cause our solar system, not to mention the universe outside of that, is extraordinarily well organized, to the point where we can predict 70 years away when a comet is coming. Now that type of organization to just come out of an explosion? I mean, you want to talk about fairy tales, that is amazing." “How about we have a transgender bathroom? ... it’s not fair for them to make everybody else uncomfortable." "I think the likelihood of Hitler being able to accomplish his goals would have been greatly diminished if the people had been armed." "Not only would I probably not cooperate with him, I would not just stand there and let him shoot me. I would say, 'Hey, guys, everybody attack him! He may shoot me but he can’t get us all.'" "One of the reasons that you find most of their clinics in black neighborhoods is so that you can find way to control that population. And I think people should go back and read about Margaret Sanger, who founded this place — a woman who Hillary Clinton by the way says she admires. Look and see what many people in Nazi Germany thought about her." "There is no doubt that this senseless violence is breathtaking — but I never saw a body with bullet holes that was more devastating than taking the right to arm ourselves away. Serious people seek serious solutions." "I think what's happening with the veterans is a gift from God to show us what happens when you take layers and layers of bureaucracy and place them between the patients and the health care provider. And if we can't get it right, with the relatively small number of veterans, how in the world are you going to do it with the entire population?" "It is mostly with the progressive movement who will look at someone like me, and because of the color of my pigment, they decide that there’s a certain way that I’m supposed to think. And if I don’t think that way, I’m an Uncle Tom and they heap all kinds of hatred on you. That, to me, is racism." "I would not advocate that we put a Muslim in charge of this nation. I absolutely would not agree with that." "The current Members of Congress have a combined 8,700 years of political experience. Are we sure political experience is what we need. Every signer of the Declaration of Independence had no federal elected office experience. What they had was a deep belief that freedom is a gift from God. They had a determination to rise up against a tyrannical King. They were willing to risk all they had, even their lives, to be free.